With all the hysteria about the Jordan Cool Grey XI re-release the past couple days, some people were thrown back to when they first released in 2001, especially with things once again becoming pretty tense out there at those late-night campouts at the mall. But some people were thrown back even farther. 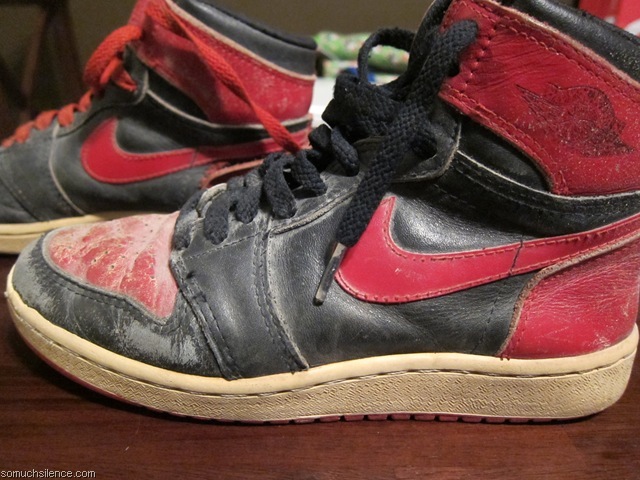 My friend Kevin, who runs the excellent music blog somuchsilence.com, told me yesterday that he still has his first Air Jordans, given to him in 1985 — which happen to be the first Air Jordans, period. He sent me some pictures, which IÃ¢â‚¬â„¢d like to share. Consider it a small Christmas gift. You might know the ones, the initial red and black Air Jordans, banned by the league because — as Michael Jordan put it — Ã¢â‚¬Å“They didnÃ¢â‚¬â„¢t have any white in them.Ã¢â‚¬Â JordanÃ¢â‚¬â„¢s brilliance on the court made them great, but so did the ban, as people clamored for sneakers that Jordan was fined for every time he wore them. Nike gleefully paid the fines, as every game enhanced the sneakersÃ¢â‚¬â„¢ market value to levels that had never been reached. 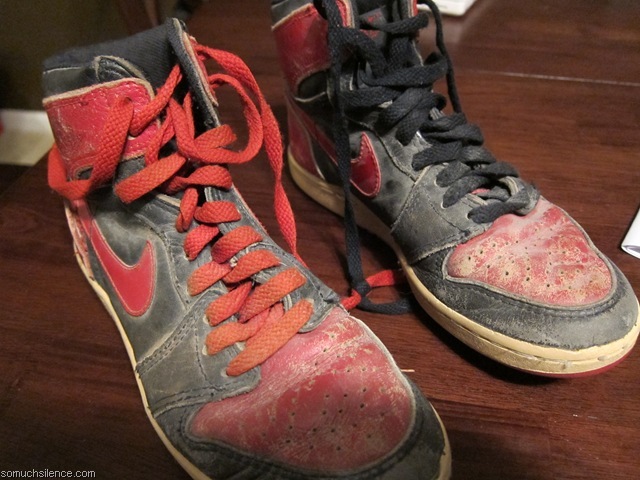 Not sure why I thought different colored laces was cool. But hey, I was in 3rd grade. SportsAngle contributor and good friend Frank Pepe swears by the first Air Jordans, and you can see why. 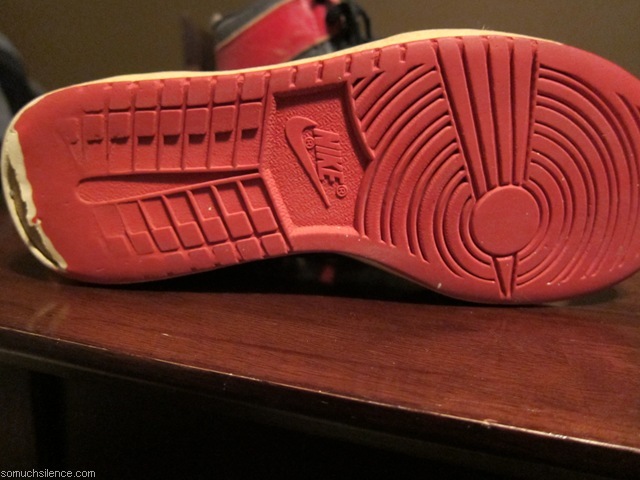 The classic stylings are reminiscent of Nike brethren Air Force 1s, but with the Jordan backstory. Interestingly, the formerly push-the-envelope nature of these Jordans at the time seems pretty tame now, even compared to the models of a couple years later. The flashy red-and-black colorway doesnÃ¢â‚¬â„¢t quite shock anymore — have you seen this yearÃ¢â‚¬â„¢s Christmas Kobes and Durants? — but compared to the primarily white-based sneakers that preceded them, they were a sensation at the time. Considering these sneakers are 25 years old, the soles held up pretty well, no? TheyÃ¢â‚¬â„¢re obviously rubbed away a bit in the back, but they look like they wouldnÃ¢â‚¬â„¢t crumble to dust if actually worn. Jordans used to be made from the finest materials, made to the specifications of the greatest player on the planet, but the Jordan brand has figured out that they can skimp on materials and still sell out. I canÃ¢â‚¬â„¢t kill them for using those business practices, but long gone and missed are the days when Jordans were built like tanks with exquisite quality. In certain ways, the iconic first Jordan wings logo having rubbed away somewhat over time makes it that much more special. 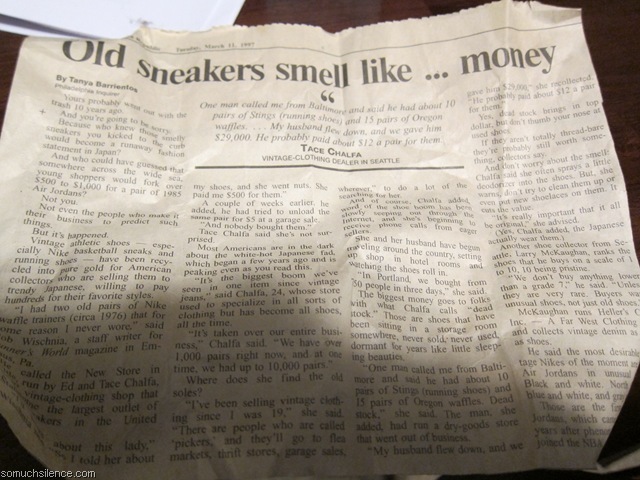 Kevin told me his mom gave him an article in 1997 about collectors of vintage sneakers, which he tucked safely away inside his Jordans. So cool. Even with the deterioration of the quality of the sneakers, Michael JordanÃ¢â‚¬â„¢s legacy has largely held up over time, despite what weÃ¢â‚¬â„¢ve learned about his various character flaws. 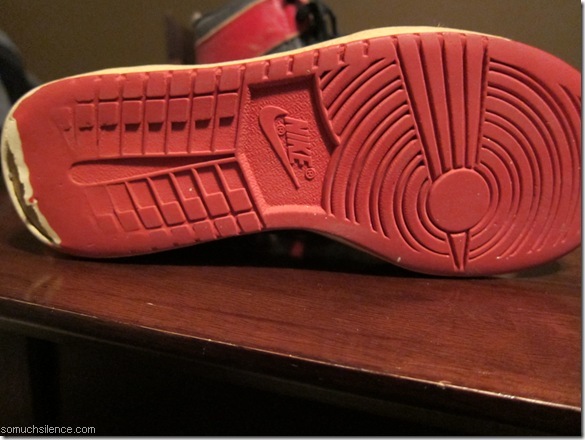 Though theyÃ¢â‚¬â„¢re obviously still in demand on the streets, a big part of their lasting value is the nostalgia that most of us have regarding our first pair. IÃ¢â‚¬â„¢ll never forget mine: the Air Jordan VII Ã¢â‚¬Å“CardinalsÃ¢â‚¬Â in eighth grade — deserving of their own post at some point, when the time is right. I donÃ¢â‚¬â„¢t know if IÃ¢â‚¬â„¢ve ever felt cooler in my life than when I showed up at school wearing my very first pair of Air Jordans, gleaming bright white in the sun. I wish I still had the original pair, but you better believe I woke up early and got to the mall to get them when they retroed in 2006. I was in North Carolina for my five-year college reunion, and proudly sat with them on the plane back to New Jersey. Looking at KevinÃ¢â‚¬â„¢s pictures, itÃ¢â‚¬â„¢s obvious that like my Cardinals, these 25-year-old kicks were not just worn to death, they were loved. 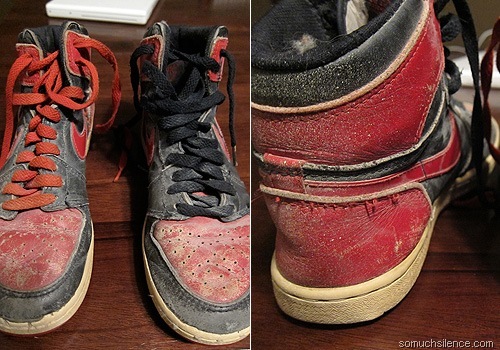 And if anyone is looking for a reason that long after he retired, Jordan still has a hold on the American consumer, you can find it in these beat-up red and black beauties. ThereÃ¢â‚¬â„¢s going to be kids tomorrow morning who open up a fresh pair of grey and white patent leather Jordans under the tree. TheyÃ¢â‚¬â„¢re not going to know theyÃ¢â‚¬â„¢re grossly overpriced at $175, or that the quality is way down from the same pair nine years ago. They might know their parents slept outside to get them. They will know that theyÃ¢â‚¬â„¢re special. ThatÃ¢â‚¬â„¢s why through all the nonsense, as time passes and generations blend together, Air Jordans keep people coming back.